Flick Hit: 10 Cloverfield Lane Review: Keeps you guessing on the edge of your seat. 10 Cloverfield Lane Review: Keeps you guessing on the edge of your seat. Although this was not directed but just produced under J.J. Abrams, I'm sure he had some say with 10 Cloverfield Lane. I recently saw Cloverfield and the whole alien in that story destroying New York City got me to go see this. J.J. mentioned, however, that 10 Cloverfield Lane is not a sequel to Cloverfield, but a sister story. There are only three characters throughout the whole film. Some would say just three people on the screen would get dull or uninteresting but with the chemistry between John Goodman's character Howard and Mary Elizabeth Winstead as Michelle it really grabs your attention. The floater who is there the majority of the time is Emmett played by John Gallagher Jr. He is a main character but not as big as Johns and Mary's. We start off with Michelle getting out of a frustrating relationship and decides to run away. Later events happen and she is involved in an accident and winds up in Howard's bomb shelter. Things are a blur to her and Howard explains that up on the surface a chemical or nuclear threat has killed everyone off and will not let anyone out or they will be contaminated. She isn't convinced and tries to get out. She soon realizes he is telling the truth through some actions she takes and begins to comply to anything Howard says. At this point of the film I felt like, "okay maybe he is a good guy and is keeping them safe", which for one he is, but he is also hiding another secret. Emmett and Michelle find things out and start to see the bigger picture, and that's what kept me interested the whole time. 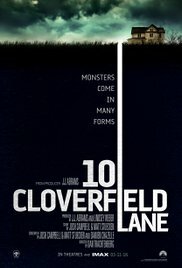 10 Cloverfield Lane kept me guessing and thinking of who Howard really was and if/when they could return to the surface. Sometimes they would hear things above like helicopters flying past but then again logically Howard would say maybe it's the Russians or North Koreans that have taken over and are making sweeps for survivors. Things got really crazy in the last twenty minutes of the film and that's when this movie sort of ties into Cloverfield, because you see things that prove Howard was partially right. I would like to see a sequel to this one because all the actors, especially Mary, kept you entertained. If you like mystery/thriller/Sci-fi I highly suggest going to see 10 Cloverfield Lane.